A gaseous exoplanet the size of Neptune has clear skies and steamy water vapor, according to a new study appearing in the journal Nature. This is the smallest planet from which molecules of any kind have been detected. NASA’s study of the red planet’s upper atmosphere began in earnest Sept. 21, when a spacecraft entered the orbit of Mars. 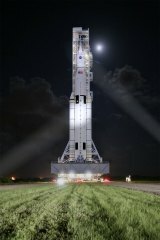 Charging forward with a plan to build a powerful rocket that will take mankind to Mars, NASA announced this week that its new Space Launch System had completed rigorous review and is advancing to the development stage. NASA In Brief -- Astronomers using Hubble spot "zombie star"
ZOMBIE STAR SPOTTED: A team of astronomers using NASA's Hubble Space Telescope has spotted a star system that could have left behind a “zombie star” after an unusually weak supernova explosion. Astronomers looking for water vapor in the atmospheres of three planets have come up dry.